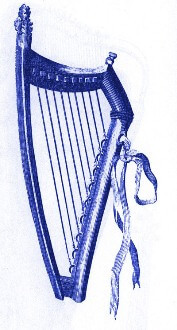 Harp Society LA is the Los Angeles Chapter of the American Harp Society. The Los Angeles Chapter presents harp concerts, workshops and other educational events, annually awards scholarships to young harp students, and hosts other fun events where we gather to celebrate the harp and to socialize with other harp enthusiasts. Our diverse membership comprises harp students of all levels and all ages, harp teachers, amateur and professional players of both lever harp and pedal harp, harp vendors, composers and arrangers, and other friends of the harp. Please see UPCOMING EVENTS at upper left of this page. If you're a member, you'll receive newsletters and/or flyers with details. You can also read about our past events in the Events Archive.